I just discovered this feature this week, but USA Shooting has made 9 years' worth of members' match results available via their website. If you go to http://www.usashooting.com/ and click the "Login" link in the left sidebar, you get to your member login area (you may have to register and/or login again). 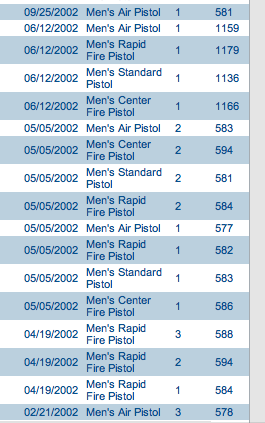 Once you're logged in to the RailStation interface, click on "Match History" in the left sidebar and you can see the results of every USAS match you've shot since 2001!